From left: Willy Tan, Man Ho (Billy) Cho, Tom Teasdale, Hailey Kurtz. Photo by Steve McGuire. It’s obvious that before you display your work at the North American Handmade Bicycle Show you have to build a frame. In the United States, builders have learned their craft on their own, on their own using the Paterek manual, and sometimes under the gaze of an honest-to-gosh frame builder. But few learn to build in a college setting. At the University of Iowa, students pick up college credit as they build frames in a course called Fabrication and Design: Hand Built Bicycle. The class attracts a wide variety of students, majoring in ceramics, computer science, engineering, English, accounting, whatever–somebody with one of those majors is likely to have built at least one frame, maybe more than one. Steve McGuire, a professor in the School of Art and Art History and endurance-event enthusiast, has taught the class since 2010. Up until mid-2014, he was often assisted by friend and mentor Tom Teesdale, who built bicycle frames in West Branch, Iowa. That’s when Tom died of a heart attack during The Register’s Annual Great Bicycle Ride Across Iowa (RAGBRAI). Obviously, Tom brought a lot of frame-building expertise to the class. Tom really enjoyed teaching. And, students really enjoyed learning from Tom. Tom spent many more hours than might typically be the case working individually with students. Many times, students would make a trip to his shop. Tom imparted a sensibility of improvising–improvising fabrication and improvising with tools. This had students seeing that they were always in a position to solve novel problems. I know Tom taught you how to build. Any other memories you’d care to share? Tom and I traveled some years ago to Camp Courageous, a program in Monticello, Iowa, for students with disabilities. Tom had made some custom tadpole recumbent tandem trikes that allowed able-bodied and disabled riders to partner, and we brought them to Camp Courageous. We spent the day being tandem partners with various students. Tom was so completely present with each person. Bees. Tom raised colonies of bees to produce honey. And many folks thought it was some of the best honey they had ever tasted. In the winter, Tom brought the hives into his shop and created a conduit system for the bees to travel. Bringing bees inside in the winter takes quite a bit of technical know-how to successfully pull it off. But he did it. “But he did it” is a way of understanding Tom. 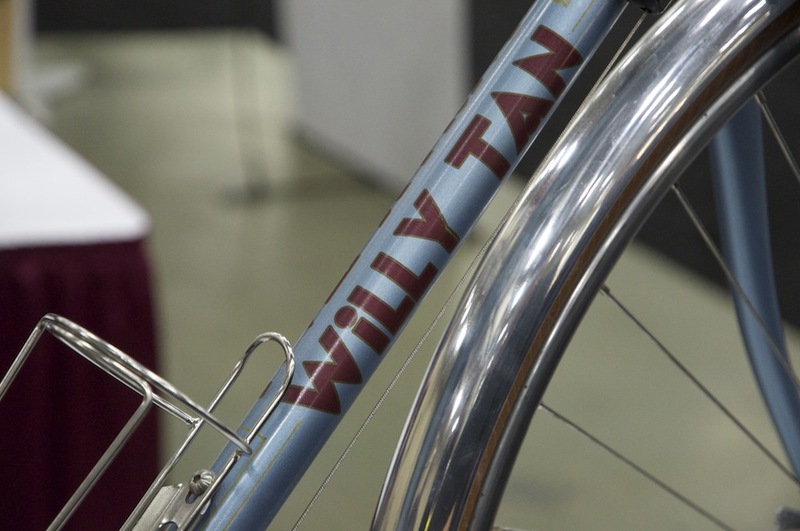 Willy Tan discusses his Alex Singer-inspired creation. This and following pictures by Mitch Hull. Decades after going out of business, Mafac makes one wonder if it turned out a blue-million brakesets or if the same ones migrate from bike to bike. Rack provides handlebar-bag support. I’m impressed by the variety of degrees pursued by your students. You seem to have successfully married art and science in your class. What is it about that marriage that is important to you? Well, students in engineering have a keen desire to match their screen-based study with tool and fabrication skills. You’ll hear, “I decided to be an engineer because I wanted to build things, but I discovered that we don’t have much building practice.” Art students have, typically, good tool experience, but less experience interpreting geometry. At its core, a beautiful frame is a well-built frame that implements lessons from the history of bicycle design and fabrication. I hope the course expands the definition of beautiful and allows students experience making something from their hands that they can use for years. What does it take to complete the class successfully? Project commitment. Students learn to TIG weld, and this can take 40 hours to get to a level where they can weld a frame. I tell them no one has not ever been able to weld, but it does take practice. 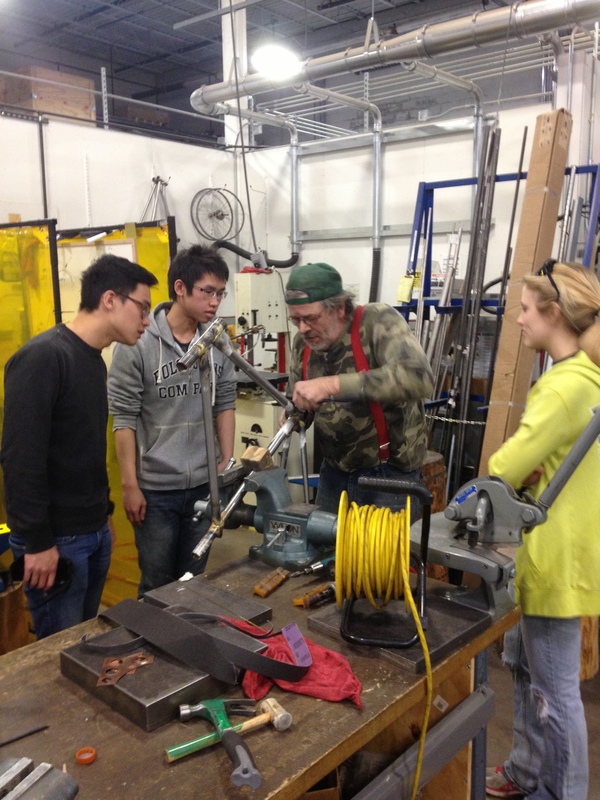 Students also learn to braze. Historically, frame building often begins with brazing the first frame. But TIG welding is a more universal skill in terms of application. You don’t braze a trailer hitch, for instance; you weld it. So, we focus on TIG welding from the start. By the way, Tom taught himself to TIG while doing the first Fisher frames. 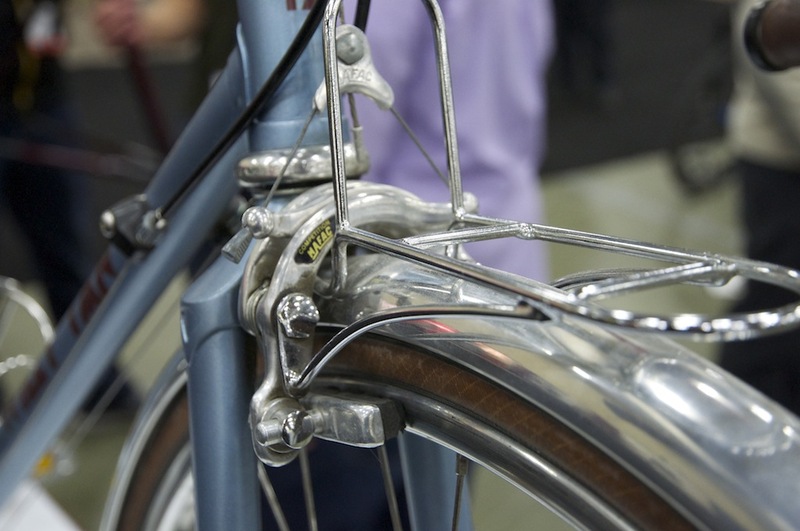 At the time, people favored smooth, fillet-brazed joints. So what Tom did was TIG weld the miters and then fillet braze over them. He learned to do it well. Patience. Good welds require tight miters, and tight miters mean repeating cuts and filing. Basic knowledge of geometry. Interestingly, students are intrigued by the difference between conceptualization captured in a drawing and the physical placement of tubes in three dimensions where level, square and triangulation reveal success. Attention to precision, not only detail. A cut that’s a half degree off and not corrected will compound as a problem. Most important: A student who doubts their first measurement for a given cut typically arrives at the better success. At the end of the semester each student has a completed frame, aligned, reamed and faced. 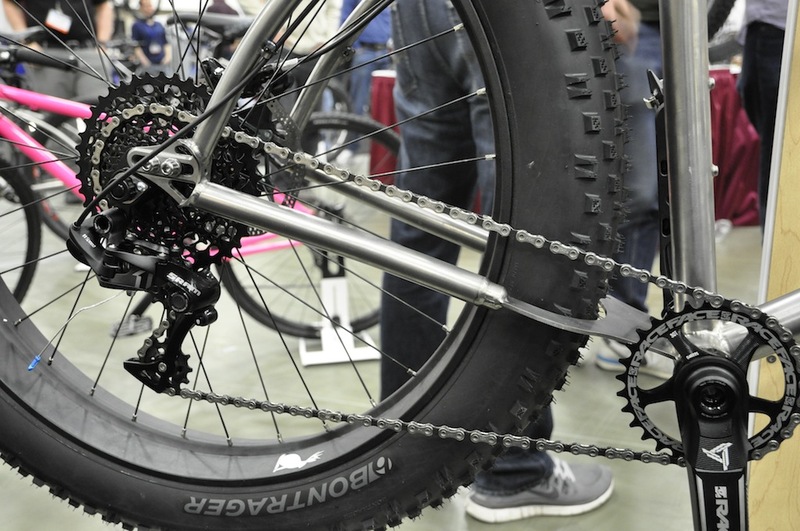 Single-chainring SRAM drivetrain showed up at the University of Iowa’s booth and several others. 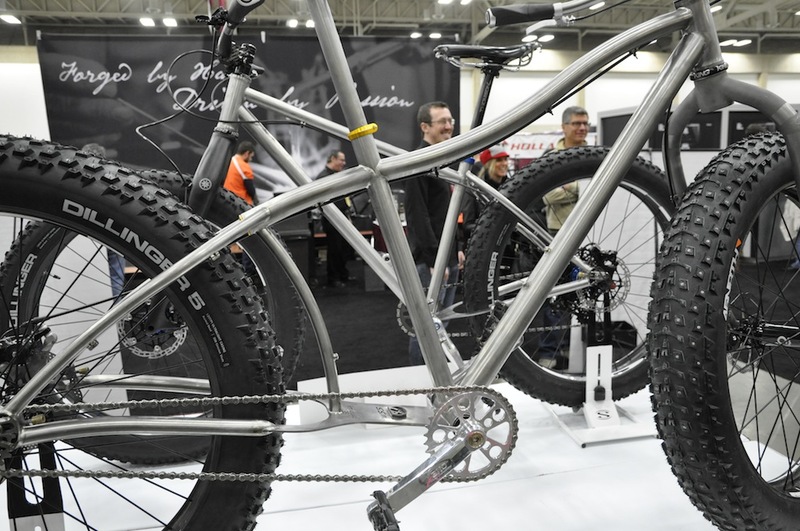 Let’s talk about a bike you built: the single-speed fat bike. Could you tell me a bit about that design? I built the bike for Arrowhead 135 in Minnesota, which I raced and finished this past January. The idea was to build a single-speed frame that would allow me to take gear, such as my bivy bag and stove, off the fork and place it more or less under me, since a punchy trail is a greater challenge with weight on the fork. The frame is 135 millimeters longer than would otherwise be the case, which gives the bike greater directional stability on snow-covered trails cut up by multiple tracks. I needed to be able to track well with the single speed, because I couldn’t use gears to make up for the loss of momentum. Extended chainstays on McGuires single-speed snow bike allow gear storage behind the seat tube, right above the chain stay. And yes, that’s a titanium frame. McGuire’s single-speed snow carver has two rear wheels, one of them on the front. I’m 57 years old. It’s easier for me to do well in an event if I pace myself. On a single speed, if I’m going too fast for a sustainable effort, I run out of gear, which tells me to slow down. If I come to a hill too steep to pedal, I would probably end up walking even if I had gears. Here’s how a typical event goes. At the start, 99 percent of the riders are probably in front of me. After 50 miles, I’ve passed a few of them. By mile 150, I’ve passed 70 percent of them, and it’s because I don’t overexert myself. I haven’t ridden a geared bike in years. I like the overall efficiency of a single speed. And I’ve eliminated the possibility of breaking a derailleur hanger. When I’m on a single speed, I’m always in the right gear, because it’s the only gear I have. 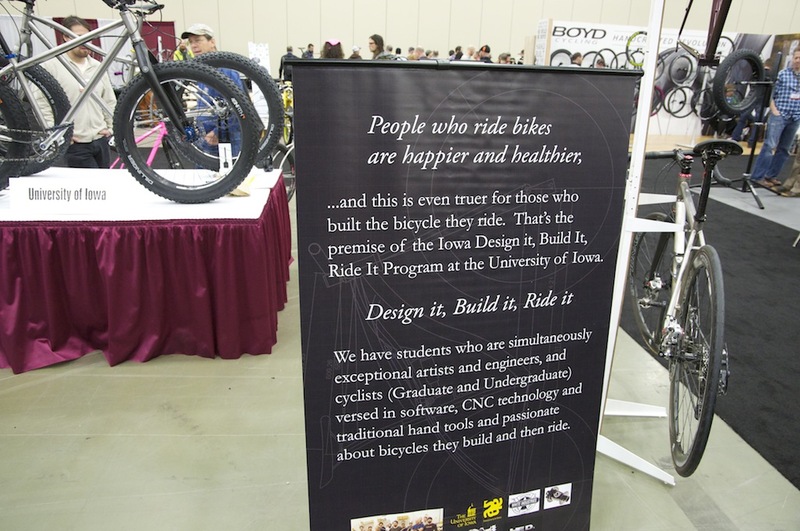 Follow Iowa student-frame builders on Facebook. 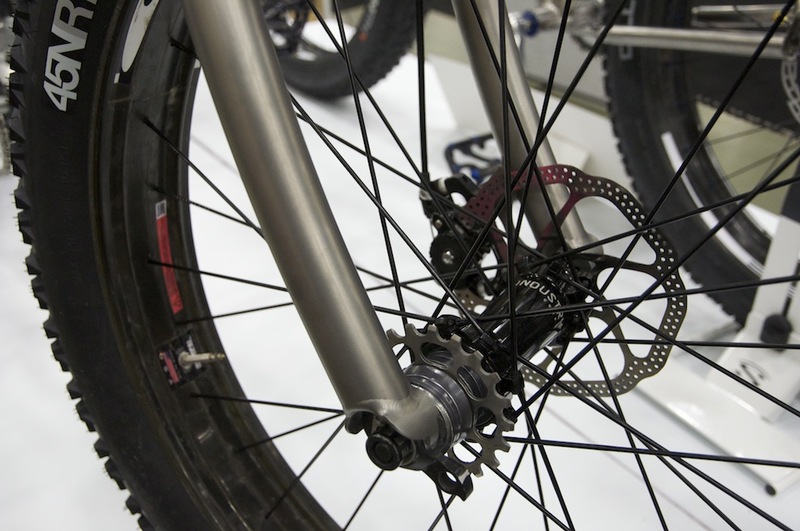 The University of Iowa Museum of Art is curating the first, and what promises to be the annual, Iowa City Downtown District Handmade Bicycle Exhibition with the work of five frame builders exhibited in downtown businesses through May 25. Builders featured: James Bleakley, Kent Ericksen, Eric Noren, Steve Potts and Stephen Bilenky. 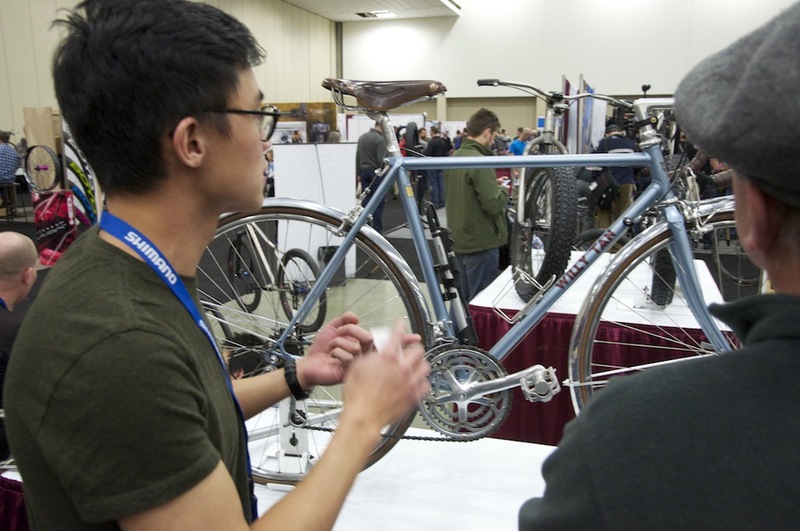 This entry was posted in Becoming a bicycle, Equipment, Other bicycles, People, Report from the road and tagged frame building, single-speed bicycle, Steve McGuire, Tom Teesdale, University of Iowa, Willy Tan. Bookmark the permalink. Thanks for the write up! It is great to see how Tom’s passion for building bicycles is still apparent and infectious in bicycle culture today. That picture really shows how a legend can be so humble and eager to pass on his knowledge. Thank you Tom Teesdale. Steve McGuire is doing good things with the Hand-built program, I’m lucky he let an accounting major take his course! On Iowa, Go Hawks! Enjoyed seeing your work–and that of your fellow students. Iowa is building an exciting, and sustainable, program.